Class inequality is such a commonplace topic, but now there’s a piece that drums up new troubling feelings. Beatriz at Dinner contains two of the year’s best performances in Salma Hayek and John Lithgow, and while the unwanted dinner guest scenario has been played out before, it rarely has had the resonance and poignancy as done here by writer Mike White and director Miguel Arteta (the transgressive and brilliant black comedy “Chuck & Buck” was a collaboration of theirs seventeen years ago). It has already been called the first comedy to serve as allegory in the Age of Trump, yet pretty much everywhere else mentioned I think it has been mislabeled as a comedy. This is a sad, disquieting film. It’s been a tough week for our protagonist, an animal lover whose goat had just been strangled by a neighbor. She maintains her decency, nonetheless. Hayek is a holistic healer who does a house call for long-term client Cathy (Connie Britton) at a posh seaside Newport Beach mansion. When Beatriz’s car breaks down, Cathy believes she is making the humane choice to invite Beatriz to their dinner party that is starting soon, and also — why not? — Beatriz can also spend the night. The occasion is a celebration dinner following a major real estate deal that will dispose of a bird sanctuary and, by the sounds of it, generally mess up ecology. The credit belongs to dinner guest Doug Strutt (Lithgow), a condescending jerk billionaire who lacks Trump’s bluster but certainly sides in a similar pride in consuming and conquering. 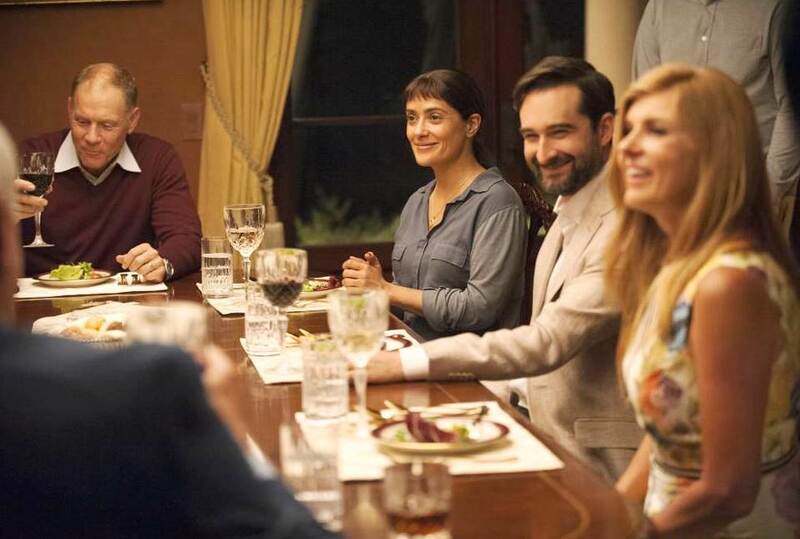 Beatriz does her best to stand back and listen to these self-absorbed materialists. When she does speak, it is usually a reverie of a distant memory which she turns into a parable. Her stories touch us, but it comes off as long-winded and precious woo-woo to these socialites. Funny thing about the rich, when you see most of them you can come to think that none of them deserve to have that kind of money, and you wish some of the poor humble people you knew had that kind of money instead. But these people, particularly the most cluelessly stuck-up Alex (Jay Duplass), cannot help that they were born into money. Is a rich trust fund baby’s admittance of that any kind of vindication? A few glasses of wine too many, and Beatriz comes preoccupied with the feeling that Strutt is the source of all her tears. We get a back story about how a real estate developer had broken up her home town in youth, and her family was broken up because of it. The showstopper of the evening is a monologue about how magnates like Strutt are destroying the Earth. “The world is dying,” Strutt explains in his retort. “What are you going to do? Accept it and enjoy yourself,” he says, with intractable capriciousness. It is no surprise that Beatriz at the end of the evening drowns in her sorrows. Hayek has been a star for so long, and it’s been long enough to have left me the feeling sometimes that it has been more for her glamour as caught by the public eye then it has for her acting. Yet as I look through her credits I am reminded of how good she can be. She was the magnificent artist as required for “Frida” which should have gotten her an Oscar. She has been a world-class sultry femme fatale or plucky sidekick (see “Savages” and “Desperado”). It would seem a cliché to say that it’s brave of her to de-glam for “Beatriz.” But it would be inelegant not to mention what wisdom she brings to the part. Her soul is stirring at this dinner, and we feel what she feels. Her counterpart Lithgow is deliciously corrupt – he’s a man you love to hate, and because that feeling is ubiquitous, the necessary seething tension if always there in the drama. I was left in a blue mood following “Beatriz at Dinner.” But that was because the film effectively plucked my sympathies for Beatriz. I originally slightly underrated the film at 3.5 stars and now give it 4, since I believe it is one of the year’s most essential dramas. Film Cousins: “Make Way for Tomorrow” (1937); “My Dinner with Andre” (1982); “The Celebration” (1998, Denmark); “Chuck & Buck” (2000).